Abu Dhabi, an emirate of the United Arab Emirates (UAE) has a total land area of 26 square miles and a population of about 900,000. 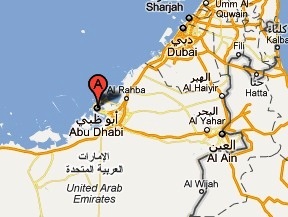 It is a T-shaped island and is the capital and the second largest city of the UAE. The area is known to have been inhabited since around 3-millenium BCE with the current ruling family’s (Al Nahyan) migration into the area dating back to 1793 AD. The area was a British Protectorate in the 19th century – part of The Trucial States, a group of sheikhdoms that signed the Maritime Truce agreement with United Kingdom in 1853. The British administered the area as princely states of British India until India gained independence in 1947. Abu Dhabi became part of the UAE in December 2, 1971 when the constitution was established as a federation of seven emirates. The first stamps of Abu Dhabi were a set of eleven stamps issued on March 30, 1964. The set (Scott #1 to #11) catalogs for around $120 MNH and around $50 for Used. The designs show head portrait of Sheik Shakbut bin Sultan at Nahyan, Gazelle, Oil Rig and Camels, and the Palace. The set was followed by another set (Scott #12 to #14) of three stamps in the Falcon theme on March 30, 1965. That set is also sought after cataloging in the $90 range for MNH and around $35 for Used. The designs show Falcon Perched on a Wrist, Falcon Facing Left, and Falcon Facing Right. The Gulf Rupee (100 Naye Paise = 1 Rupee) was replaced by the Bahraini Dinar as the areas currency on June 6, 1966. The first stamps with the new denomination (1000 Fils =1 Dinar) were a set of eleven stamps that were overprints on the first issues from 1964. That set (Scott #15 to #25) catalogs for around $275 MNH or Used. The first original issues with the new denominations were a set of twelve stamps issued on April 1, 1967. The set (Scott #26 to #37) catalogs for around $90 MNH and around $35 Used. The designs show head portraits of Sheik Zaid bin Sultan al Nahayan, Crossed Flags for Abu Dhabi, Dorcas Gazelle, Falcon, and Palace. Following the formation of UAE, the Dinar was replaced by the Dirham (1 Dirham = 0.1 Dinar) in December 1971. The first issue after the currency conversion was a Green surcharge overprint on the 50f Sheik Zaid issue of 1970 (Scott #60). The stamp (Scott #80) is sought after and catalogs for around $85 MNH and around $65 Used. The issue was followed on June 3, 1972 by the last issue of Abu Dhabi before UAE stamps were adopted – a set (Scott #81 to #83) of three stamps showing different views of the Dome of the Rock in Jerusalem. The set (Scott #81 to #83) catalogs for around $155 MNH and around $35 Used. The Indian Rupee was the currency used in Abu Dhabi until 1966 when it was replaced by the Bahraini Dinar. The Dinar was replaced by the UAE Dirham in December 1971. As such, there is no currency or coins specific just to Abu Dhabi. Souvenir Postcards, themed ceramics, airline plane models, etc form the popular collectible souvenirs of Abu Dhabi.